In the last years, digital technologies strongly burst into the traditional concept of “agriculture” triggering a revolutionary change of paradigm. Like in every young technological field, some of the emerging solutions will reach a high level of adoption, some of them, instead, will fail and disappear. Hence, what are the technologies in the future of sustainable precision agriculture? Which tools should an agripreneur of tomorrow be able to manage? To answer these questions, we are performing a foresight analysis, based both on patents and on scientific literature as sources of information, aimed to outline the actual technological landscape and look ahead to its future evolution. In the first part of the analysis, we have defined a set of more than 400 000 patents concerning precision agriculture, trough specific queries. Then, starting from this huge set, we have selected two fields of interest: viticulture and arable crops. Data Processing: technologies for the treatment of different types of data. It refers to computing systems and algorithms. Measurement and data detection: sensors allowing the measurement of physical units such as distance, temperature, pressure etc. Data transfer: systems that enable the transfer of data and information collected. This cluster includes aerials, wireless communication systems and similar. 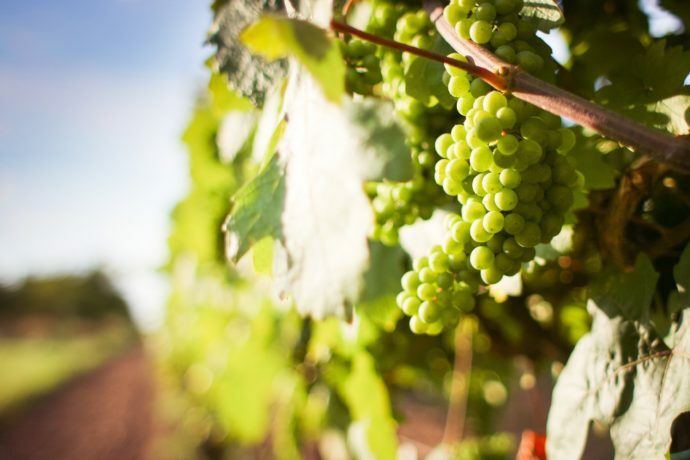 Harvesting: systems for grape harvesting. Vineyard care: devices for irrigation, protection and pruning of the vineyard. The following graph shows the distribution of patents’ filing through the years, from 1990. 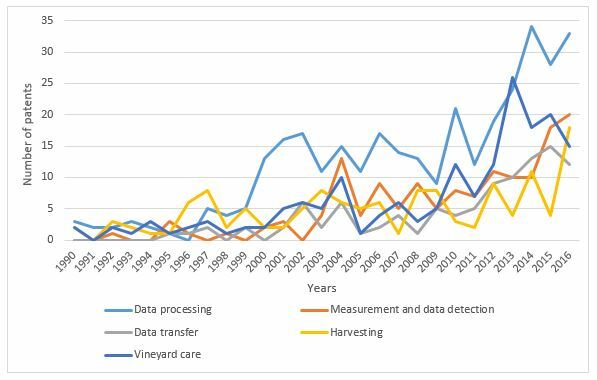 Some clusters are rapidly growing in time, in particular Data processing, Measurement and data detection, Harvesting. These clusters will be analysed more in depth to understand which technologies are the most promising.